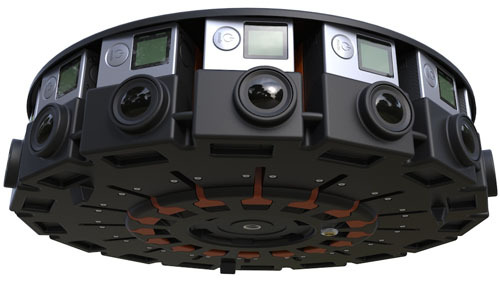 GoPro and Google have joined forces to create a Virtual Reality camera rig with 16 GoPro HERO4 cameras. It’s called Jump. It can transform 16 pieces of video into one stereoscopic 360 degree VR video. The 360 degree camera array allows all 16 cameras to act as one. This makes camera syncing easy, and includes features like shared settings and frame-level synchronization. Google is asking filmmakers, journalists, and producers to test the hardware. YouTube is planning to showcase the VR videos. They want applicants to describe the ideas that they have for the system. Go to this Google Document to apply. As Tech Crunch says think of it like an arts grant. Expect a lot of competition. You could share your great idea on Google Cardboard, the DIY Virtual Reality Headset.